Priced at Rs. 4,650, Funbook P280 would be available across all leading retail outlets in India from 11th February 2014. 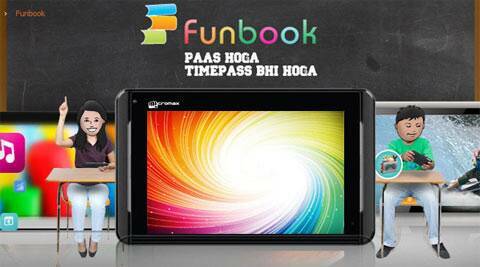 Micromax, today announced the launch of its new tablet – the Funbook P280. Enhancing the entertainment quotient for the users, the device is targeted at the consumers who are seeking a seamless experience on-the-move. The Funbook P280 comes with a sleek detachable keyboard and a premium leather case along with a slew of latest features across the entertainment portfolio. A perfect combination of hardware, content and seamless connectivity for a high-quality and engaging experience, Funbook P280 is poised to change the way multimedia is consumed on the go. Sporting a light and sleek design, the new Micromax tablet boasts of excellent graphic quality with a range of smart features. Sporting a 7”, 5-point capacitive multi-touch screen, the device promises to offer superior graphic clarity and vivid colors. Designed for fun and work on-the-go, the tablet is packed with a 1GHz Cortex A8 processor and powered by a 2400 mAh battery enabling users to manage assignments, run applications and browse the web efficiently. Running on Android 4.2.2 Jelly Bean, the tablet offers a simplified UI, easy multitasking, customizable home screens and a full suite of familiar applications – as well as powerful new ways of communicating and sharing via the pre-loaded Google Play Store. With the Funbook P280, there will never be a dull moment as it offers a wide range of fun-filled applications like M!Live for latest online, videos, games, music and news; Spuul to stream latest blockbuster movies and TV shows; Opera Mini for superior browsing experience and Kingsoft Office Suite to manage all assignments on the go. With an expandable memory of 32GB and 512MB RAM, users do not need to worry about storing their favorite music, videos and much more on the latest tablet from Micromax which supports 3G dongle and Wi-Fi connectivity options.